It is once again time for the Secret Recipe Club. know a fellow blogger that I don’t think I would normally visit. Thanks to Angie Barret at Big Bears Wife, who teamed me up this month with The Freshman Cook. The Freshman Cook is a beginning cook. At least that is what Teri mentions on her blog. She loves to cook and bake and is very enthusiastic about it. She wants her blog to inspire us, and it does. Her favorite thing is to teach people how to cook. She certainly has done that with her Chicken and Dumplings. Which is what I chose to make. Cook the chicken in a pot of water with the salt, vinegar, onion, and celery, Allow to simmer for 60 – 90 minutes. When the chicken starts falling apart place in a bowl or cookie sheet to cool slightly. Pull out 1 cup of broth from the pot. Keep the rest of the broth in the pot but discard the celery and carrots. Meanwhile place flour, salt and egg in a bowl. Stir in reserved broth, enough to make a soft dough. Roll out dough into strips and add to the boiling broth. DO NOT STIR. Reduce heat and allow to simmer for about 10 minutes. Dust the top of the pot with pepper. Ladle into warm bowls and enjoy. I love the Freshman cook! This looks perfect for the lousy Danish weather we have at the moment – as Aly said, perfect comfort food! 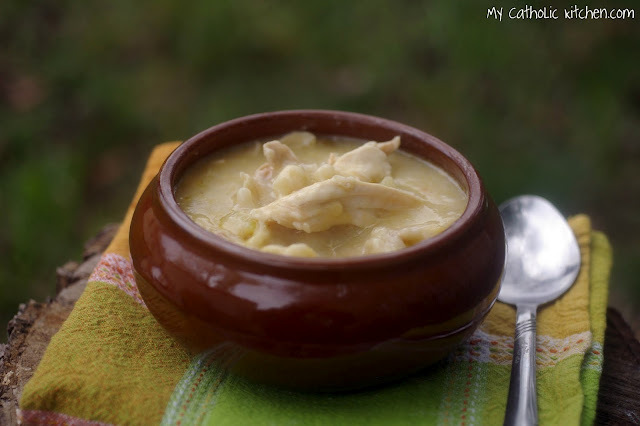 I’ve never made chicken and dumplings so I had to check this out! It looks really delicious and creamy. Were these the kind of dumplings that are fluffy or like noodles? I have a friend that can not get her dumplings to come out fluffy like her grandma used to make so I was thinking of sending her here. This looks so good! Once we move out of warm summer weather, I m going to have to make some chicken and dumplings, can’t think of the last time I did! I am glad you like the chicken and dumplings.They look fabulous! Thanks for making The Freshman Cook look so good! Looks very nice! I’m impressed! I also have a similar posts with my homemade noodles and a turkey soup I made back in early March. mmmmmm there is nothing better than chicken and dumplings, my grandma can really make it well but I have never tried to make it…guess I better get started! I just love Teri’s blog! Amazing pick for this month. It looks wonderful! That looks great!! 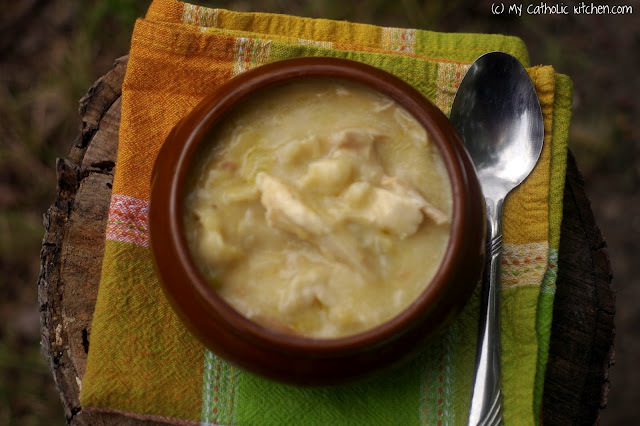 I’ve never actually tried chicken and dumplings – I may have to give it a try. Awesome choice for SRC! 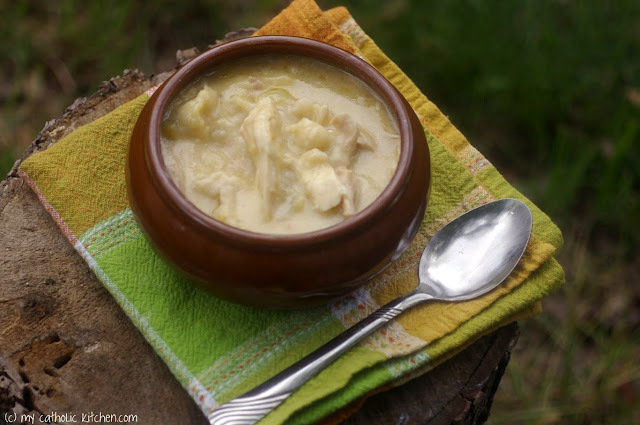 I have never eaten chicken and dumplings–I must try this recipe! Looks delicious. Great SRC pick. I’ve only recently made chicken and dumplings for the first time, what a perfect comfort food meal and yours looks wonderful. Wow, making that dish would have definitely taken me out of my comfort zone too. It looks absolutely amazing. Your photos are gorgeous too. Mmm saving this one for winter!